science events | Science, I Choose You! I had the opportunity to lead a session with Melissa Beattie Moss from Penn state on expanding outreach programs during the International Public Science Events Conference. I figure that I might as well share my slides and notes here 😀 I do warn you that the presentation is a bit dry only because I tried to cover a lot of the logistics and management stuff that one needs to think about when expanding a science outreach program. If you see anything interesting and would like me to elaborate, feel free to let me know. You can find my personal notes below the slides (only for those that are not self-explanatory). Enjoy! First few slides: bragging about Vancouver, UBC, and our outreach program. Slide 10 : First thing I did was to start a e-mail newsletter list. I used MailChimp to manage subscribers, make pretty newsletters, and track what our subscribers are interested in. It will send 12,000 emails to 2,000 subscribers for free. Impact: now have 450+ subscribers, camps get fully registered really quickly, we stop buying ads for paid events, which usually cost us about $1200. There are a few other similar services out there – I just decided that MailChimp fits our needs. Another option I often hear is Emma Inc., although they do charge a fee to start. Slide 11 : I use survey monkey to collect feedback from activity participants. It is a good way to get qualitative feedback for funding or promotion purposes. Also good to let them know you are listening and looking for ways to improve. If you run your own server or have IT people to help you, you can consider LimeSurvey, which is free and open source. Slide 12: I actually put together a list of all public event listings in Vancouver. You only need to do it once – can use the list over and over again for different events. Slide 13: Social media. Won’t elaborate much here because it is another talk perhaps. If you want to tap into social media power, only use the relevant ones that will allow you to connect to your audience. This is only general. There are of course exceptions – ask me if you have questions about this. Slide 14: Having an event that you can all work on together is a good way to start a collaborative relationship. 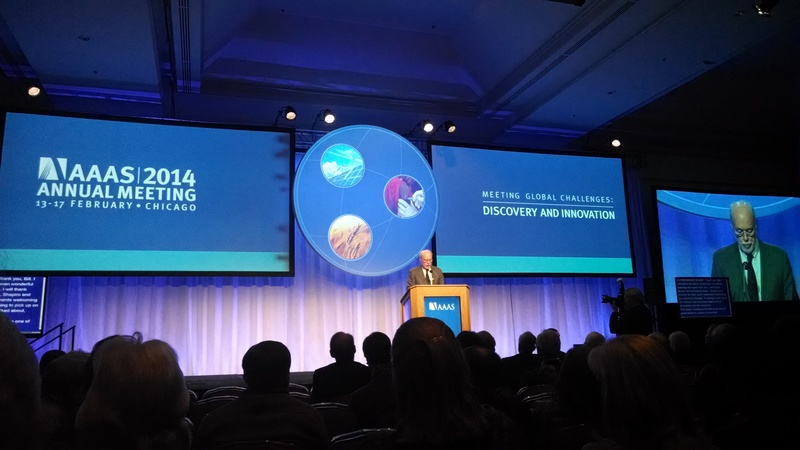 Note (Feb 15, 2014): The AAAS President’s Address is now available online via the AAAS website! Please do take a little bit of time to watch it. Opinions are mine but would love to know what you think. Also thanking AAAS for letting me know that the video is available. 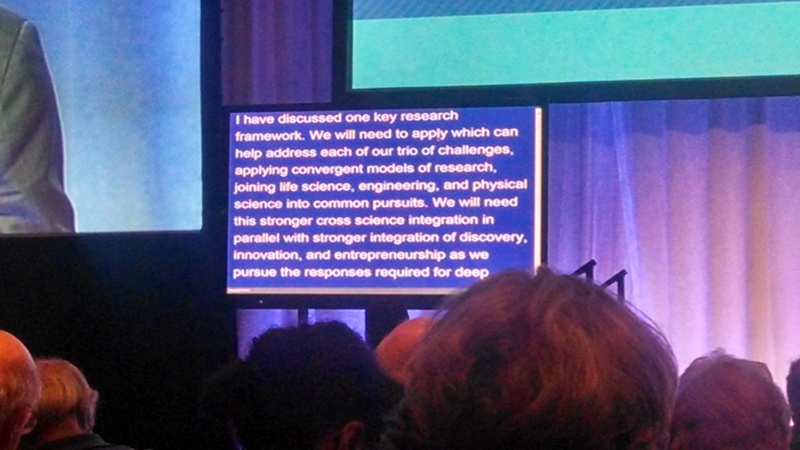 In case you don’t know yet, I am currently in Chicago attending both the International Public Science Events Conference (just wrapped up today) and the AAAS annual meeting (American Association for the Advancement of Science annual meeting, also the largest general science meeting in the world with more than 10,000 participants). Maybe it is because I have been going to sessions on how to better communicate science and to reach a broader audience for the past 2 days, maybe it is because I am always pretty sensitive about the level of a talk when students and young scientists are part of the audience. 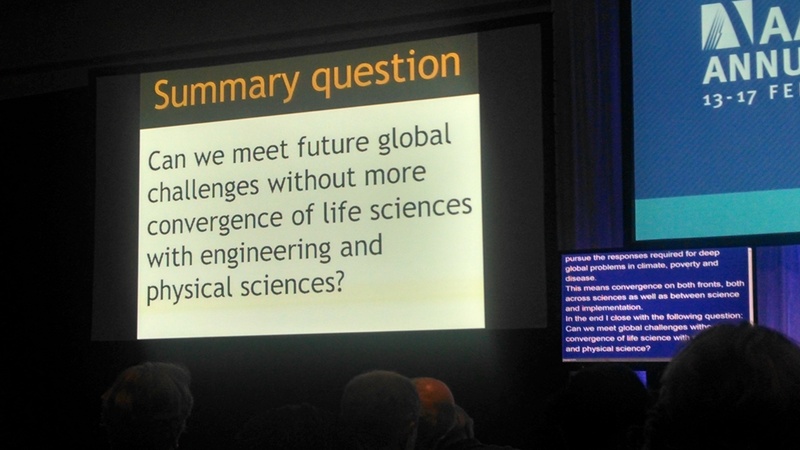 But for me, the speech by Nobel Prize Laureate and AAAS President Phillip Sharp on the first night of the AAAS annual meeting, did not to inspire me. Philip Sharp is a molecular biologist who won the Nobel Prize in Physiology or Medicine in 1993 with Richard Roberts, “for their discoveries of split genes.” If you studied biochemistry in the past (oh, wait, I did! ), you would know that it is a pretty big deal (well, it is a huge deal). Back in the days, we didn’t know that the DNA code for a gene is not really just one continuous chain of information. What Sharp and Roberts found was that after the DNA code is translated into mRNA, parts of it called “introns”are removed. And it is based on this processed (spliced) mRNA that proteins, the building blocks of an organism, are actually made. The cool thing is that sometimes different ways to splice the DNA code could result in different proteins being produced. You can learn more about it from the slide show provided by the Nobel Prize website. Like I said, I studied biochemistry for my undergrad degree, so this is really exciting for me. I was truly looking forward to a talk in which he incorporate his experience and vision (or that of AAAS) for science, for future scientists, and for this AAAS meeting. Perhaps. AAAS is not an event for the general public. 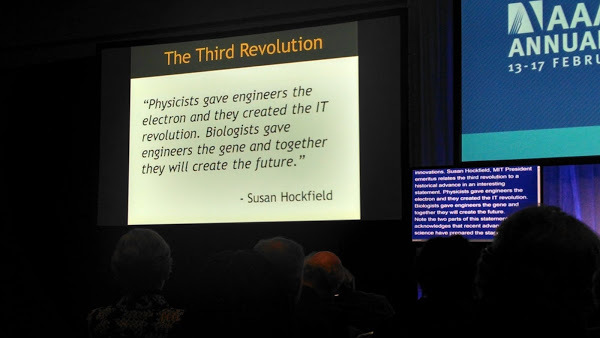 Yet with so many budding scientists in the audience, and the brightest high school students attending the conference via the American Junior Academy of Sciences, with attendees from all over the world, I feel frustrated and sad that this was a missed opportunity- that this speech did not make me feel like I should go home and think about how I could contribute to moving science and innovation forward. I just wanted to go back to my room and write this post. It doesn’t mean that all scientists should be perfect science communicators. Not all of us can be Brian Cox or Neil deGrasse Tyson, and not all talks should be like their talks to the general public. Yet I believe that we can all find ways to improve ourselves, or talk to others (scientists, non-scientists, your parents, cousins, pretty much anyone you can find) to make sure the message is delivered to and understood by the audience. Right now my brain is split into many pieces: one for editing research grants, one for helping out with a research roundtable, one for planning upcoming public events, one for writing blog posts, and one for my personal life (yes, I do have one apparently :P). 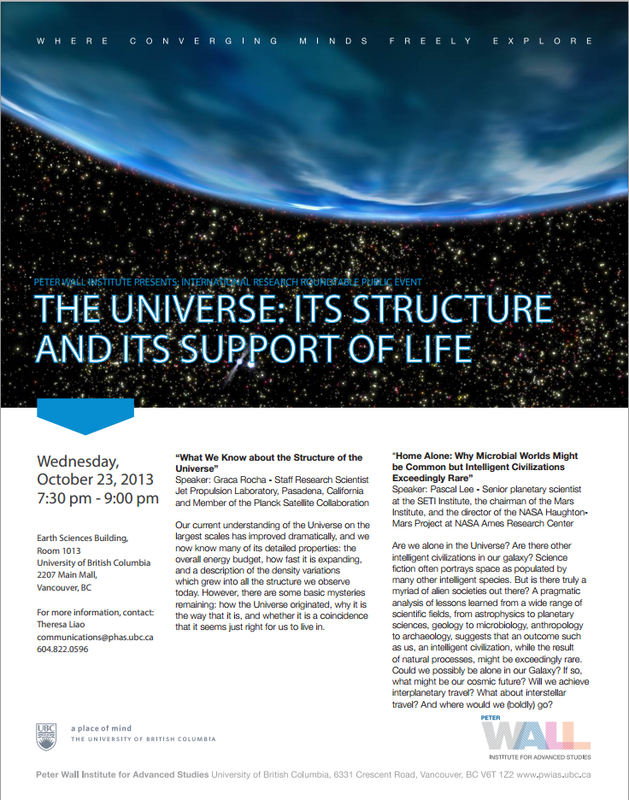 But my busy schedule also means that there are some public science talks coming up! This week, there are 3 international roundtable events happening at the UBC Peter Wall Institute for Advanced Studies. Since its founding two decades ago, the mission of the Peter Wall Institute for Advanced Studies has been to create collaborative, interdisciplinary, basic research programs for scholars at all stages of their career. It is one of only 30 similar institutions worldwide devoted to the free pursuit of learning and research at the highest levels. No RSVP required, but make sure you arrive a little bit earlier to get a seat. There is a plan to film the session to make it publicly available in the future. This is a public lecture that I am involved in organizing. The two speakers, Graca Rocha (Staff Research Scientist, Jet Propulsion Laboratory, Pasadena, California and Member of the Planck Satellite Collaboration) and Pascal Lee (Staff Research Scientist Jet Propulsion Laboratory, Pasadena, California and Member of the Planck Satellite Collaboration) will be talking about our understanding of the Universe and what the future holds for us in searching for another civilization in our Universe. Several experts will be speaking about the science of ocean acidification and how it affects the marine ecosystems. Topics will cover an introduction on ocean acidification, its effects on coral reefs, the research experience from Scandinavia, and what we can do in the future. There will be a poster session after the lecture, so you will have a chance to see the research projects done by UBC students and post-docs. How do we define who we are? Am I my brain? Join a group of scholars, writers, and artists in the discussion of neurocentric thinking – “the worldview that situates the brain as the key organ that provides meaning to our lives.” The evening will begin with a performance by Sarah Chase, a world renown dance/literary artist, and will follow with short presentations by scholars. And don’t forget that I continue to update upcoming events on the Events page. You can subscribe to the Google calendar on the page by clicking on its icon at the lower right corner of the calendar.